AirSign offers a variety of professional and reliable aerial advertising services including airplane and helicopter aerial billboards, skywriting and advertising blimps that get clients massive attention very quickly over big events like the Ultra Music Festival. We design and print custom aerial billboards to your exact specifications and then fly them over the markets you choose using our banner towing airplanes. Spring break has begun, and all across the country millions of college students are busy planning and enjoying the fun and relaxing getaways. One spring break hot spot, both literally and figuratively, is Miami, Florida. This month, the popular vacation destination will be hopping even more than usual because of the popular Ultra Music Festival, which will be held in the city’s Bayfront Park from March 23-25. For companies who would like to advertise their services and products, reaching the huge crowd of concert-goers would be an ideal opportunity. However, traditional advertising methods can often be challenging when dealing with such a large group of people. But this is not the case for AirSign, a leading, full-service aerial advertising agency. AirSign has been creating quite a buzz lately for its amazing airplane advertising services that can reach literally thousands of people at one time. The company recently began booking aerial advertising flights for the Ultra Music Festival in downtown Miami. “We design and print custom aerial billboards to your exact specifications and then fly them over the markets you choose using our banner towing airplanes,” an article on the company’s website said, adding that each client’s custom aerial billboards can be flown over beaches, sporting events, cruise ships, lake shores, parades, state fairs, golf courses, and rush hour traffic – just about anywhere. The staff at AirSign takes company logos and artwork and uses them to design outdoor advertising banners that can be seen and remembered by many. 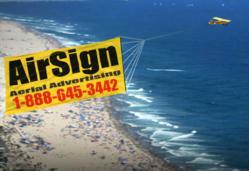 The company can handle both national aerial advertising campaigns as well as those that target smaller markets. Employees at AirSign help their clients throughout every step of the process, including the design of the banners as well as selecting the best locations to fly over. The upcoming Ultra Music Festival is definitely an ideal spot for aerial advertising. The event, which is billed as the world’s premiere electronic music festival, sold out almost immediately. Another advertising option that AirSign can provide is through airships or blimps. These large vessels float almost silently across the sky, usually only about 1,000 to 1,500 feet in the air. This ensures that everyone on the ground can clearly read the advertising and logos that are printed on their sides. In addition to booking spring break events like the music festival, the friendly and qualified staff at AirSign stays busy all year long helping customers from around the country with all sorts of advertising services. From beach advertising to skywriting, NASCAR to political advertising, the company prides itself on offering top-notch, professional service that is reliable and effective.